I'm Teresa Pilar Huarte. 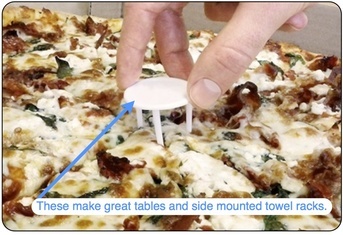 I'm an artist of all sorts and always have been since I first began making my own dollhouse furniture from re-purposed "pizza savers" as a child. Then I grew up a bit, and in 2003 I earned my Bachelors of Fine Arts in Sculpture from The University of Washington and was awarded Best Sculpture Student and a Best Art Student nomination. 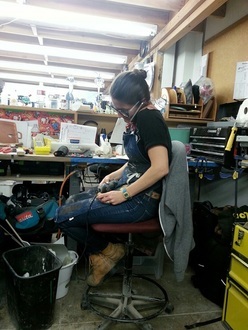 Focusing in Sculpture allowed me to learn as many tools, methods, and materials as possible; laying the foundation to begin learning how to design and build anything I could imagine. Since then I've been traveling around the United States and beyond pursuing a wide array of creative projects that challenge and inspire me while expanding my material, tool and building processes knowledge. My diverse experience has included designing, making and styling: custom props, sets, special effects and models for television, film, photo shoots and theater. I've also been doing retail visual merchandising displays and murals, designing and making re-purposed interior design decor and furniture, creating interactive installations and contemporary gallery art work. Some of my credits and clients include: Documentary NOW, The Shivering Truth, Portlandia, Nike, Adidas, AT&T, Madewell, Colombia Sportswear/Sorel, Kroger, Trader Joe's, Chevy, Cartoon Network, Amazon.com, Green Room, Robot Chicken, Hell and Back, NBC's Holiday Special, Elf Buddy's Musical Christmas, The Librarians, Perfectionists and Grimm. Whenever possible I also enjoy showing my work in gallery art shows and making custom pieces for various clients. You can explore a lot of the jazz I've been up to on my portfolio page and by following my instagram feed. Maybe one day we'll collaborate on some special stuff together.